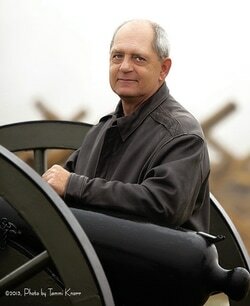 C. James Gilbert, an author since November 2012, has been a Civil War enthusiast for more than forty years. Aside from being an avid reader on the subject, he has made an extensive tour of Civil War battlefields all over Pennsylvania, Maryland, Virginia and West Virginia. In the past, he has also been a collector of Civil War relics. A true supporter of human equality, Mr. Gilbert has completed a trilogy on the subject, titled, The Langdon Trilogy: An American Civil Rights Story. This series was inspired by Gilbert's deep-rooted aversion to the plight of the Afro-American race in the antebellum south and a passion for the Civil War. Raised in the fifties and sixties, Mr. Gilbert witnessed the televised events during some of the most turbulent times in Black America’s struggle for equal rights. It is the memories of those times and his love of history that inspired his literary work. A native of Gettysburg, Pennsylvania, C. James Gilbert now lives in Littlestown, Pennsylvania with his wife of thirty-five years. He works part-time as a residential electrician, continues writing, and enjoys spending time with his children and grandchildren.